After one more mild day and a shot of rain, freezing temperatures will return to the region for the upcoming weekend. A hard freeze is possible, especially north of I-12, Saturday, Sunday and Monday mornings. Today and Tonight: Beyond morning fog, skies will remain mostly cloudy with southeast winds of 5-10mph and highs in the low 70s. Spotty showers will be possible throughout the day, but nothing widespread or organized is expected until evening. A line of rain and thunder will roll into the region after dusk. Most, if not all, of the WBRZ Weather forecast area can expect rain from this, mainly between 7 and 10pm. Winds will shift northerly as a cold front pushes through and overnight lows will dip back into the mid 40s. Clouds may be a bit stubborn to break through sunrise. Up Next: Cold and quiet weather is ahead. 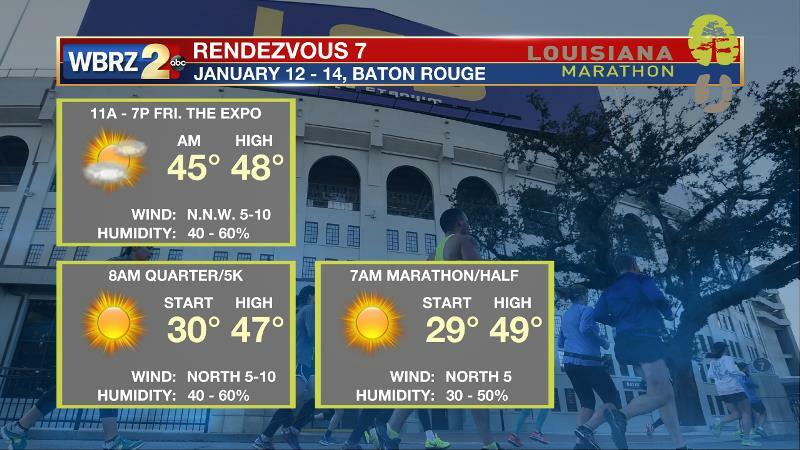 With a busy weekend of running in the Capital City, participants and guests of the Louisiana Marathon should plan to bundle up. Morning temperatures will be below freezing with highs only climbing into the upper 40s during the afternoon hours. Skies will stay clear through the weekend though. A reinforcing shot of cold air on Tuesday will keep southeast Louisiana and southwest Mississippi temperatures below average through much of next week. The Explanation: Dense fog will mix out by mid-morning. 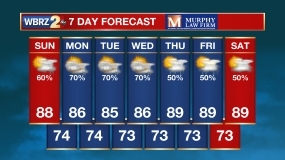 Onshore flow will keep temperatures unseasonably warm for your Thursday. Spotty showers are possible through afternoon ahead of a system that is expected to move through the region tonight. A cold front will increase rain coverage from west to east shortly after dusk. The threat of thunderstorms is low as instability is lacking, but a few rumbles of thunder are certainly possible. Behind the front cold air advection will quickly kick in on Friday as daytime highs will be at least 20 degrees cooler and struggle to reach 50 degrees. The clearing skies and cold pool will result in lows dropping into the upper 20s and lower 30s across the entire forecast area Friday night. Thermometers will go back into the freezer for overnight lows over the weekend and into early next week. A reinforcing cold front should sweep through on Saturday and then high pressure will build into the area. Highs will only climb into the middle to upper 40s both Saturday and Sunday, but lows Saturday night should fall into the lower to middle 20s with a hard freeze likely along and north of I-10/12. Going into next week, forecast models suggest another quick reinforcing shot of cold air on Tuesday with little to no rain in sight.